Is your student curious about natural science but you don't know how or when you can work it into your homeschool schedule? Do you feel that books about different types of ecosystems, although interesting, leave something to be desired when using them as a teaching tool? You should check out Digital Frog International! Designed by teachers, Digital Frog International has been designing natural science software for over fifteen years. These award winning programs cover a wide range of topics including: ecosystems, anatomy, and cell structure. As a member of the TOS homeschool review group, I was lucky enough to receive a free copy of The Digital Field Trip Series. I received this program free of charge in exchange for an honest review on my blog. 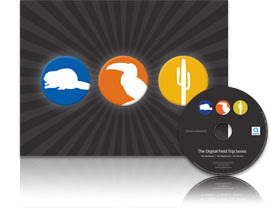 The Digital Field Trip Series contains three interactive "field trips" that explore three very different ecosystems: wetlands, rainforest, and desert. It was my full intention to explore all of these field trips with the boys for the purpose of this review. I let James (fourth grade) choose which one to start with. He chose the desert trip and we began our exploration. That was over a month ago and we haven't even had a chance to think about the other ecosystems. The boys seem to have forgotten that the program had three different trips. They are still interested in the desert alone. The program is THAT good. It is an educational computer program that is both informative and interactive. After loading the software onto your computer, you will be led into the ecosystem that you choose. 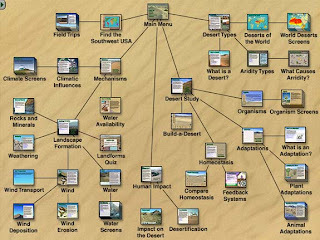 The desert program focuses mainly on the deserts located in the Southwestern United States, but does have topics that cover the major deserts of the world. From the menu, you will be able to choose specific deserts and learn about desert types, rocks, minerals, weather, animals, plants, and human impact. 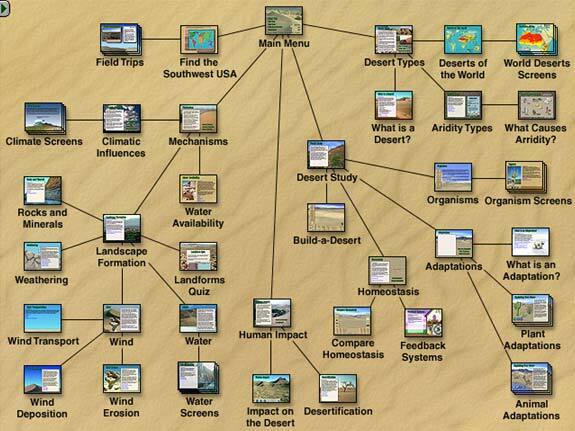 One of the best features is the interactive map (see below) that allows you to quickly choose what aspect of the desert to study. Another great feature is the ability to view actual images of the desert. Click on the image and move your mouse around to get a 360 degree view of the area from that exact location. Also, the program has a built in dictionary. While reading about a particular topic, click on almost any word and a little window pops up with a definition of that word. You can even hear the word pronounced. At first we were modest and clicked on uncommon words like 'sediment' and 'wadi.' Then we got a little silly and clicked on words like 'from' and 'the' ('the' is not defined). Workbook pages and teacher materials are also included. You are able to print exactly what you need from the material. They have included special materials for students in kindergarten to third grade. Other moms in the TOS program have gotten a lot of use out of these supplementary materials. My boys are still too busy "exploring" the desert. The digital field trip program is available through the Digital Frog website for $125.00 for home use. This DVD includes all three digital field trips, supplementary materials, and the home use license. Click here for more pricing information. If I did not receive this program through the TOS review program, I probably would not have seriously considered purchasing it. $125 is a lot of money for a computer program, and we are not really a "computer" family. However, now that I own the program, I can not imagine our Earth Science curriculum without it! I am currently structuring our entire science year for next year around this program. It offers so much more information than our traditional approach to earth science. I wouldn't hesitate to recommend this program to any family looking to enhance their science curriculum.